Utus Part 1- an insight to life for a local teenager in Buho Buho. He lives with his older and younger sister and father. His mother lives in the capital, Daruba where she has found work. Utus left school a year ago as the family did not have enough money to send all three of their children to school. It costs about 300,000 IDR (that’s about $22 U.S.) to pay for uniform and registration. (Utus will return to school in June as we have provided him with a scholarship due to his hard working, honest, enthusiastic nature). He usually wakes up at 5am and will do house chores such as washing up, fetching water from village well. Then he may go with his father to their “kibung” or “ladang” – this is an area of land in the jungle (each family has one) where they grow produce for their consumption and then some to sell. Common crops include, ubi (casava) a staple in their diet, pineapples (the most delicious you’ve ever eaten), coconut palms to produce copra, cloves and nutmeg for which the Maluku are so famous historically. Some of the locals have kibungs close to the village, some walk about 5 to 10km or even stay overnight at a shelter they have built. Utus often comes back with a coconut for us that he has harvested from his kibung. What a diamond! Utus LOVES surfing, he lives for it. His quiet, unassuming nature morphs in to a fearless, gallant warrior when he enters the ocean. He charges! 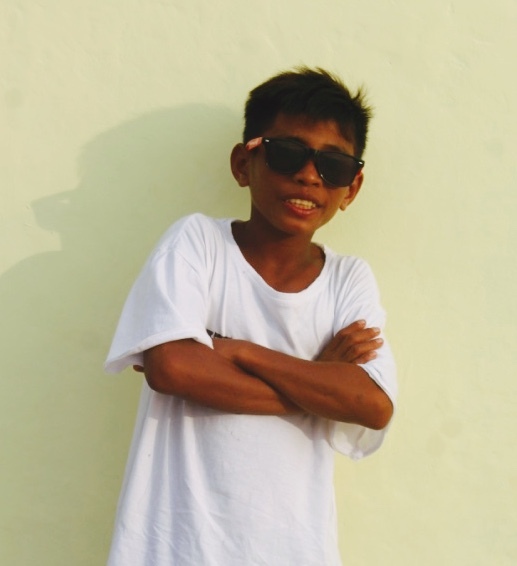 He’s not very tall, only about 4′ 5″ or that strong due to poor diet (most children are malnourished in Morotai) but his skill, timing, courage and synchronicity with the ocean and the waves mean he effortlessly strokes into the wave of the day again and again. With no internet kids are creative and inventive….Utus loves drawing and has painted the bottom of the board we gave him for helping us out with our surf classes. Kids have many responsibilties from an early age in communities here. Parents are busy working in the ladangs and when kids have free time, they are ready to enjoy it! Complaining isn’t in their psyche so you have to figure out through different ways if they are keen or not to do something as they will never say no outright. The strong hierarchical structure that pervades Indonesian society is evident. If you are younger you listen and obey! Connection is something we all seek in life and with Utus it’s all in his parting look. If you give a smile, look him straight in the eyes and say “Bye”, his face lights up, a huge smile breaks out across his face and you almost see his heart swell in his chest. He’s a grommet of few words generally speaking, happy to listen and absorb what’s going on, but when he does have something to say, usually when he’s very excited, there’s no stopping him. He has an Uncle, Ferdi, who works building a new resort just up the road. He also shreds in the water and smiles wisely when he sees Utus rip. He knows, as do all the older local surfers, that they have a true warrior in their midst, humble, stoic and spirited.